American wheel includes 38 numbers as far as it has an extra 00 (double zero) symbol. Numbers from 1 to 36 go randomly on the wheel and are colored in red and black while the color of 0 and 00 slots is green. To win this game you need to predict the number where the ball is to drop after the wheel will end its spin. European wheel has 37 symbols on the wheel. The basic principles for gaming it are the similar to the listed above. 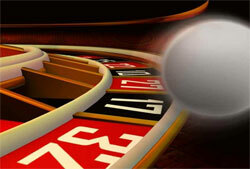 Alike online slots virtual roulette is the most popular casino game of a chance. Having read proper information will be very useful before opening own purse and start depositing the cash. The playing standards are very simple to understand and apply in further gaming. At the same time in order not to depend only on luck one should study possible strategies and gain skills in betting. To play virtual roulette you just need to bet on any random number and press the appropriate button that will load the wheel making it spin around. When the ball will be about to fall in any of the slots you will be no more allowed making new bets. If the player made the bet on a symbol that turned out to be the winning number you may welcome the luck and celebrate the triumph. First of all it is necessary to allocate definite amount of money you want to spend during certain gambling session. Be smart enough to stop and quit when need because if you don't it may bring you to disappointment and empty your pockets. Do not raise or multiply your bets on one and the same slot as it is very risky and taking into consideration that the roulette is a game of chance you may suffer great losses as the house edge in this game is very high. In case you won impressive amount of money do not risk it putting on a single bet because the chances to lose it all are very high. And quick losses of unexpected and high benefits are the worse result in gambling.